The two most popular cuts from the first compilation on one limited 7 inch records. Our first adventure into 7s. This is our raw funk release from Kingston Upon Thames chief funker Dr Rubberfunk and those pesky Bass Snatchers from Copenhagen. A simply must have record! Our first release of 2005 is ready for general consumption. 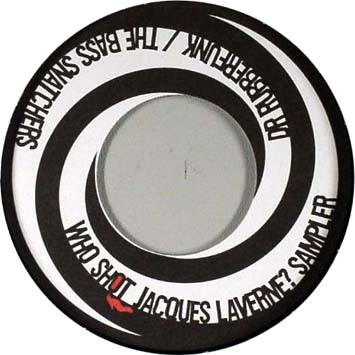 Jack to Phono Records enjoyed a prolific end to 2004 with the label's first CD sampler now in shops round the globe. We have been hit by requests for Dr Rubberfunk and The Bass Snatchers on vinyl- so we made a pledge! True to our word we have delivered our pledge on 7 inch vinyl so DJs of the world can unite and spin these two gems on the turntables. 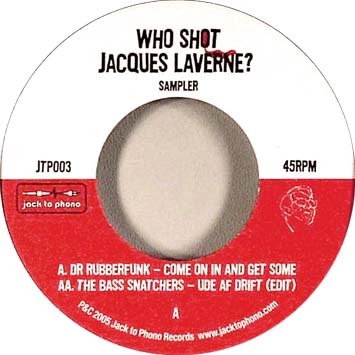 The 'Who shot Jacques Laverne'' saga rolls on and here is the latest instalment. Second up we have those Danish troublemakers The Bass Snatchers - with a new edit of their 'Ude Af drift' number, which translates to out of order. It has been described in certain quarters as a deep 60's soundtrack. We have a new shorter edit without the crackling- their wacky sense of humour nearly caused a delay on manufacture! If you are visiting Copenhagen look them up with seven band members one of them is bound to be doing something funky at the weekend!